The hardest things about Blogger’s Choice swaps for me is chosing a recipe to make! Usually, I can find a few dozen I’d be happy to try out. How do I decide? I recruit my husband. I handed him a list of potential dishes off of Jaida’s blog and he looked at it for about two seconds before declaring, taquitos! So, taquitos it was. I had pre-cooked the chicken and bacon, which made these a super easy weeknight meal. And, the leftovers packed great for lunch the next day. They were a big hit and I’m sure we’ll be making them again! Thanks, Sarah, for hosting! Preheat the oven for 350F degrees. In a medium bowl, mix together the bacon, chicken, cream cheese and green onions until well combined. Divide mixutre between tortillas and roll up. Place the rolled taquitos seem-side down on a lined baking sheet. Bake for 15-20 minutes, until browned and crispy. Meanwhile, in another bowl, mash the avocado. Add remaining dip ingredients and stir until smooth. Serve dip with warm taquitos. Check out what the rest of the swap participants made below! Thanks, Sarah, for hosting! 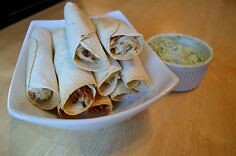 I love taquitos and have been wanting to make this version for awhile. Yum!